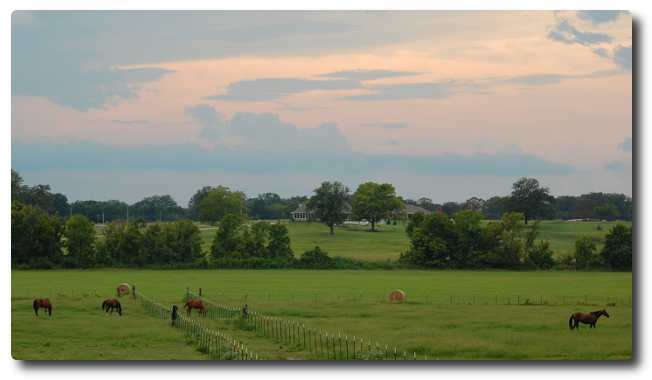 Dogwood Trace Trakehners is a small breeding farm of Trakehner sporthorses located in Aberdeen, Mississippi. 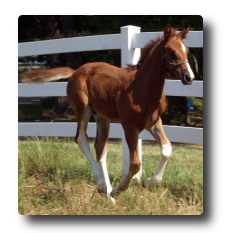 The mission of Dogwood Trace is to produce one or two quality foals each year. It is owned and operated by Glenn and Nancy Schmidt. "For we walk by faith, not by sight." 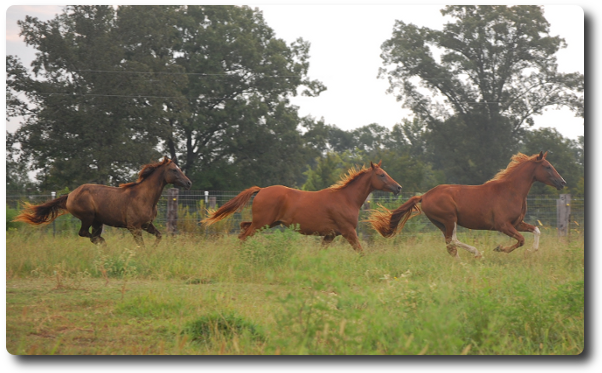 Dogwood Trace Trakehners is currently home to 9 horses (7 Trakehners, one Arabian and one QH/Arabian cross), two cats and a dog. Glenn is a retired chemical engineer who has been riding for many years. 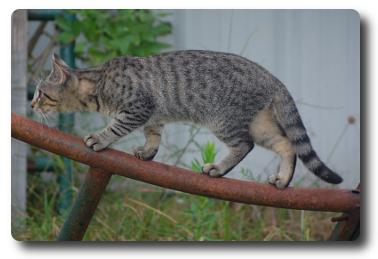 In the past he has competed in show jumping, and is currently studying dressage. 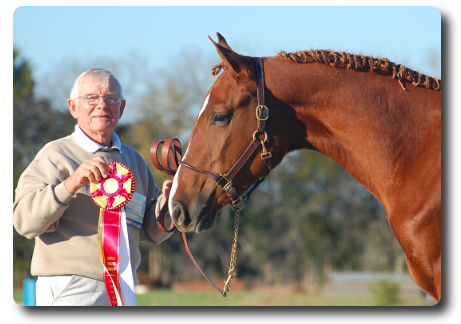 Glenn serves as a board member/trustee of the American Trakehner Association. 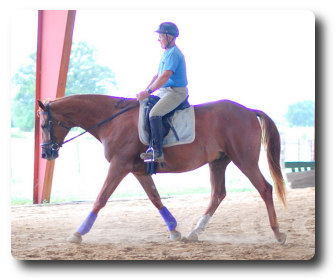 He enjoys riding and schooling horses. Nancy has been around horses her entire life. She showed Equitation, Huntseat, and Dressage, as well as rode on the Arabian Circuit, for many years. 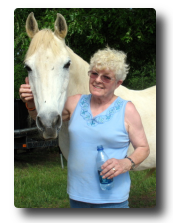 She later rode endurance with her Arabian gelding Micah. 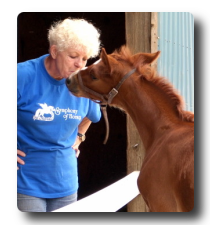 Nancy has been involved with therapeutic riding for over 30 years and has started two different therapeutic riding centers. She is a certified PATH Intl./NARHA instructor. 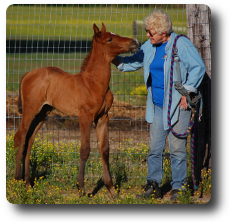 Nancy loves playing with the baby horses and teaching ground work. 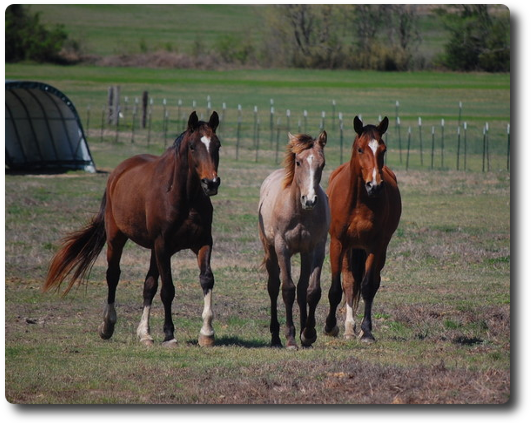 Nancy & Glenn give credit to God for the gift of their beautiful horses. 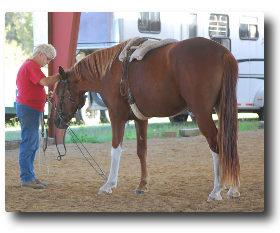 They view their horses as ministry opportunities to share their faith in God and the blessings He has given them. 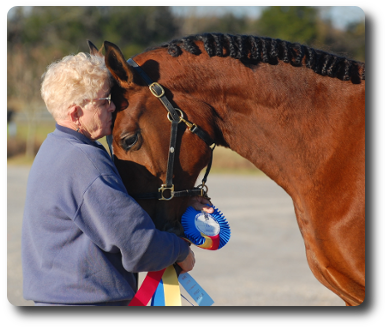 They enjoy taking their horses to shows to promote the Trakehner breed and show people what God has done for them. 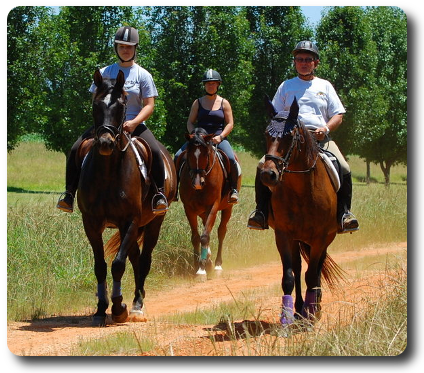 The Schmidts try to give their horses names that reflect their spiritual beliefs and legacy. Nancy and Glenn incorporate a lot of natural horsemanship techniques in their methods. 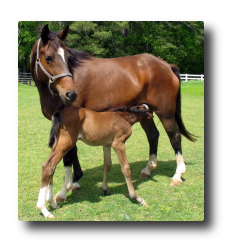 Horses are handled daily from birth and trained from a young age with gentleness and consistency. Nancy and Glenn utilize the round pen to teach horses' voice commands and respect/obedience towards people. 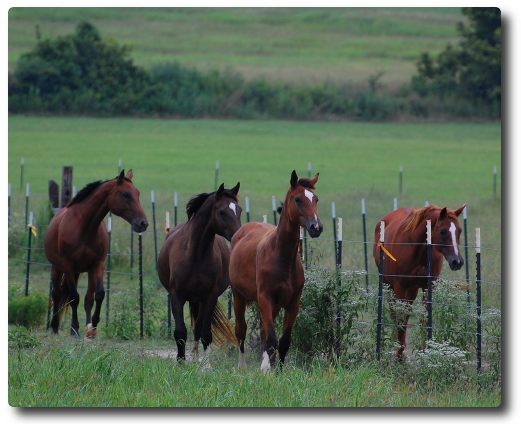 Horses are brought along slowly to insure mastery of concepts before introducing more complex requirements. The Schmidts adapt each horse's training program to its physical & mental maturity and unique style of learning. 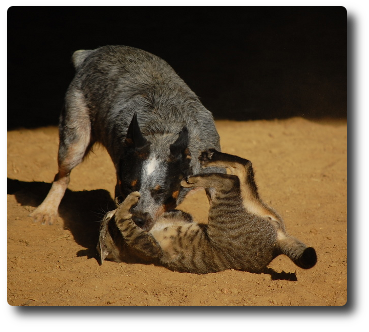 Dixie is an Australian Cattle Dog (also called blue heelers). 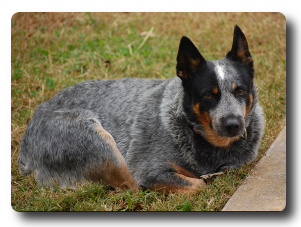 She is a very loyal and faithful companion and loves to be with people. 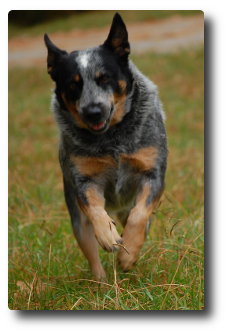 Dixie is incredibly intelligent and understands a vast number of commands. 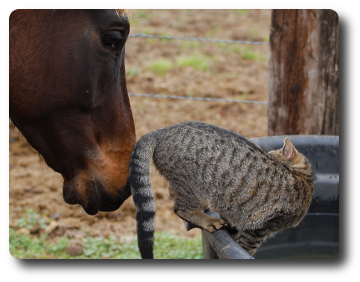 Dixie has a special bond with resident cat Tumbles. 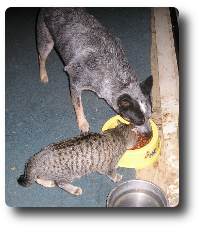 Dixie will allow Tumbles to eat her food with her and she frequently consents to engage in mock fights with him. Dixie plays very gently and never opens her mouth (much less uses her teeth) on Tumbles. 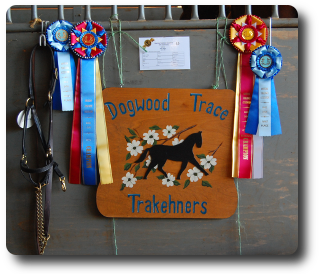 Ginger joined Dogwood Trace Trakehners in the summer of 2013. 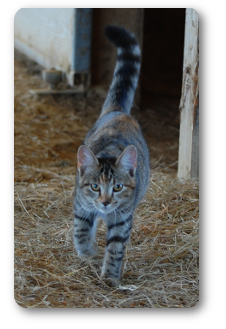 She is very affectionate and loves people. 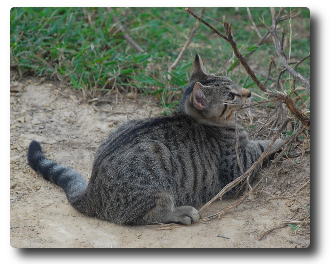 Her and Tumbles get along great and she enjoys teasing him.